Hohenzollern-Sigmaringen was a principality in southwestern Germany. Its rulers belonged to the senior Swabian branch of the House of Hohenzollern. The Swabian Hohenzollerns were elevated to princes in 1623. The small sovereign state with the capital city of Sigmaringen was annexed to the Kingdom of Prussia in 1850 following the abdication of its sovereign in the wake of the revolutions of 1848, then became part of the newly created Province of Hohenzollern. The senior Swabian branch is not as well known to history, as is the junior Franconian line which became Burgraves of Nuremberg and later ruled Brandenburg-Prussia and the German Empire. The Princes of Hohenzollern-Sigmaringen ruled over a small principality in southwest Germany, with a seat at Sigmaringen Castle. Unlike the Hohenzollerns of Brandenburg and Prussia, the Hohenzollerns of Sigmaringen remained Roman Catholic, along with their cousins of Hohenzollern-Hechingen, the senior line of the Swabian branch of the House of Hohenzollern, and Hohenzollern of Haigerloch. The principality became a sovereign state in 1815 after the abolition of the Holy Roman Empire in 1806 and an independent realm following the Napoleonic Wars in 1815. Its ruler, Charles, was deposed in the revolutions of 1848. His son, Karl Anton, succeeded him, and turned to Prussia for aid. Prussian troops arrived in August 1849, and in a treaty signed in December Hohenzollern-Sigmaringen was annexed by Prussia, effective in March 1850. 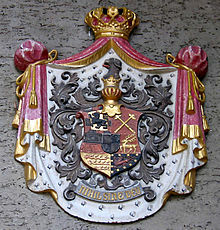 The annexation of their state did not, however, mean the end of the importance of the House of Hohenzollern-Sigmaringen. The last prince, Karl Anton, served as Minister President of Prussia from 1858-61. Karl Anton's second son, Karl Eitel of Hohenzollern-Sigmaringen became prince (1866–1881) and then king (1881–1914) of the Romanians, under the name Carol and the house remained on the throne until the end of the Romanian monarchy in 1947. The last King of Romania, Michael, died on 5 December 2017. Because the eldest Hechingen line of the Hohenzollerns became extinct in 1869 with the death of Constantine, Prince of Hohenzollern-Hechingen, the head of the Sigmaringen branch, Karl Anton, dropped his line's suffix and took the title of Prince (Fürst) of (all) Hohenzollern. French opposition to the candidacy of Carol's elder brother Prince Leopold for the throne of Spain triggered the Franco-Prussian War (1870–1871), which led to the founding of the German Empire in January 1871. From 1061 until 1806 five of these fiefs (not including Nuremberg) constituted an immediate territory of the Holy Roman Empire under the counts of Zollern, vassals of the Holy Roman Emperor. From 1806 until 1813 the Hohenzollern lands were a realm of the Confederation of the Rhine, a short-lived state set up by Napoleon I Bonaparte. From 1815 until 1849 the principality was a sovereign country and a member of the German Confederation. In 1849 it lost its independence, and was incorporated into the Kingdom of Prussia as the Province of Hohenzollern. The German Confederation was succeeded in 1866 by the North German Confederation, which itself was succeeded by the German Empire in 1871. In 1918, the kingdom of Prussia became the Free State of Prussia, and the German Empire was replaced by the Weimar Republic. In 1933 the republic was replaced by the Third Reich. After the defeat of the Nazis the province of Hohenzollern was merged with other territories into the state of Württemberg-Hohenzollern. This state was part of the Allied Occupation Zones in Germany until 1952. In that year, the state of Württemberg-Hohenzollern was merged into Baden-Württemberg, a state of the Federal Republic of Germany. The English translation is: His Serene Highness (HSH) [name] by the Grace of God, Prince of Hohenzollern, Burgrave of Nuremberg, Count of Sigmaringen, Veringen and Berg, Lord of Haigerloch and Wehrstein. Prince Karl Eitel of Hohenzollern-Sigmaringen reigned and, being childless, was succeeded by his nephew Ferdinand on the throne of Romania. The modern state of Romania was formed by merger of the principalities of Moldavia and Wallachia in 1859 under the Moldavian domnitor Alexandru Ioan Cuza. He was replaced by Karl Eitel of Hohenzollern-Sigmaringen in 1866, who ascended the throne as Carol I, Prince of Romania. During the Russo-Turkish War, Romania fought on the Russian side. In the 1878 Treaty of Berlin, Romania was subsequently recognized as an independent state by the Great Powers. In return for reverting to the Russian Empire three southern Bessarabian districts that had been regained by Moldavia after the Crimean War in 1852, Northern Dobruja was acquired. In 1881, the principality was raised to a kingdom and Prince Carol became King Carol I. He reigned until his death in 1914, and was succeeded by his nephew, Ferdinand. Shortly after taking the throne, Ferdinand, a Roman Catholic like his predecessor, agreed to have his children reared in the Romanian Orthodox Church. In 1918 Transylvania and Bessarabia were incorporated. In 1918-19, confirmed by the Treaty of Versailles of 1919 and the Treaty of Trianon of 1920, most of the Banat became part of Romania. Also, Bukovina was incorporated in 1918. Ferdinand died in 1927. His eldest son, Crown Prince Carol, having renounced his rights, Carol's only son Michael ascended the throne. In 1930, however, Carol reclaimed the throne and was crowned Carol II. Carol was forced to abdicate in 1940, and Michael re-mounted the throne. His reign, and that of the dynasty, ended when he was forced to abdicate by a communist regime in 1947. 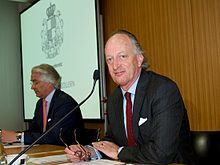 On 10 May 2011, following lawsuits brought in Germany against his family by his German relatives regarding attribution of the title Prince of Hohenzollern-Veringen to his son-in-law, Radu Duda, Michael severed dynastic ties with the princely house of Hohenzollern-Sigmaringen, changed the name of his family to "of Romania", and ceased the use of all princely titles borne by him and his family that derived from the German Hohenzollerns. During the reign of Carol II of Romania his son, Michael, was styled "Măria Sa (M.S.) Marele Voievod de Alba Iulia" or the English translation "His Grace The Grand Voivode of Alba Julia". 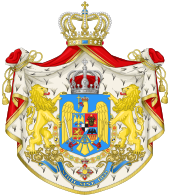 Major coat of arms of the kingdom of the Romanians (1922). Members of the House of Hohenzollern reigned as monarchs in Europe. ^ a b Eitel Frederick II, Count of Hohenzollern and Burgrave of Nuremberg became Hereditary Chamberlain of the Holy Roman Empire by appointment of Joachim I, elector and margrave of Brandenburg, Arch-Chamberlain of the Holy Roman Empire, and confirmed by Maximilian I, Holy Roman Emperor.